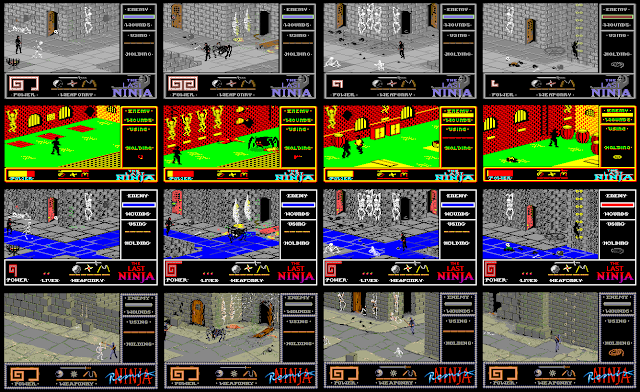 So here's an interesting thought: The Last Ninja must be of the most argued C64 games of all time. I've been pondering on this thought for quite a while, because it was the first thought that crossed my mind when I decided to start writing a comparison of it. In the past decade or so, The Last Ninja had suffered of a questionable development story, which has only recently been corrected by Hugh Riley and Mark Cale themselves for the Games That Weren't website. There was talk of an Hungarian team called Andromeda being behind all the work, but although they had actually been called in to originally develop the game for System 3, nothing useful came out of it, and so what came out has been proven to have been made by the team mentioned above in the credits. Well, this bit of controversy wasn't really known back in the day, but there is an interesting preview version out there with hints about elements that were left out of the final version. And it was this preview that the C64 gamers knew their wishes would finally come true - they would have a proper isometric 3D adventure game with smooth animation and interaction. But the arguments remain. There are people out there, who are easily able to beat this game blindfolded - at least on the C64, and then there are those who curse the day System 3 decided to release this game due to its "bad" controls. Of course, history speaks for itself, but there are still those unaware of The Last Ninja's impact and long-lasting legacy. The Last Ninja reportedly has sold over 4 million copies worldwide, making it one of the best-selling C64 games of all time. Currently, the original is ranked #19 in the Lemon64 voters' Top 100 list with at least 100 votes for a game, and it has earned its place with a score of 8.7 from a total of 366 votes. At Abandonia, the DOS version has been rated a fair 3.1 from 3133 votes, and the site's editor has also given it a round 3.0, so it's at least well above average. 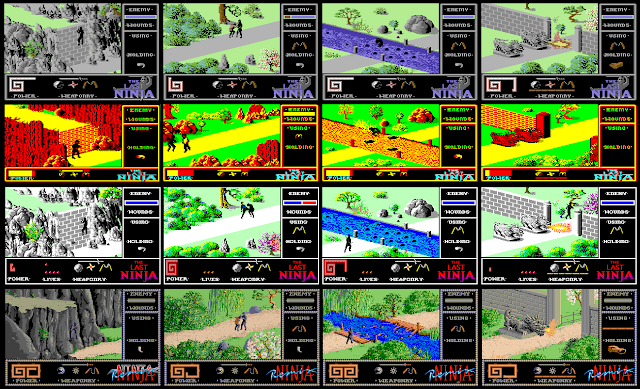 From the two Ninja Remix versions, the Atari ST one has a nice 8.2 from 10 votes at Atarimania, although it should be noted, that there is also a pre-release version of The Last Ninja on the ST, featuring the full game, only with the soundtrack copied from International Karate. This pre-release has a score of 9.2 from 5 votes at Atarimania. At LemonAmiga, the rating is now 7.46 from a total of 48 votes, so while it's not bad, it's not exactly what you might have expected. All the other scores had to be taken from MobyGames, since the most popular Acorn and Apple ][ websites don't really have ratings in them. At MobyGames, both of the Acorn versions have 3 votes with a score of 4.7 each, and the two Apple ]['s have very similar scores - 4.3 from 5 votes for the regular Apple ][, and 4.4 from 4 votes for the GS. And no reliable score for the Archimedes version was found. According to the game's legend, the awesomely powerful Ninja brotherhood of Togakure mountains was nigh on destroyed by the evil Shogun Kunitoki, with a little help from his friends in the Nether World, while all of the Ninjutsu were travelling to the island of Lin Fen to receive new teachings from the Koga scrolls at the Shrine of the White Ninja. Kunitoki's wrath was escaped by one last Ninja, Armakuni, for he was ordered to guard the Bunjinkan Shrine while his brethren were pilgrimaging. Eventually, Armakuni hears of his fallen brethren, and sets out to take revenge on the evil Shogun and all his followers. For all the good it has ever done for the isometric action-adventure genre, that's really all the Last Ninja is, as a series. For some gamers, who have had preconceptions about a great ninja adventure being mostly fast and furious fighting action with lots of stealth elements, these games must have been a great disappointment. The Last Ninja's biggest problem always was the expectations it would undoubtedly arouse, but once you got over the fact that it's not a Ninja Gaiden clone, you might grow to like it or hate it, mostly depending on the version you're playing and the controller you've gotten used to. Most isometric games of the time were arcade-adventures with plenty of puzzle elements and large maps, in which most rooms would look like every other room. Also, if the player character was something with feet, your movement would normally be limited to four main directions (which, of course, look diagonal in action due to the isometric aspect), and you rarely had any means to defend yourself against all the potential dangers. The Last Ninja wasn't the first game to offer a more expanded freedom of movement in isometric games, but it was the first one, in which a human-form player character was able to move around with more freedom than in games like Knight Lore or Head Over Heels. Also, if I'm not entirely mistaken, it introduced several manners of combat in an isometrically viewed adventure game: hand-to-hand, melée weapons and throwable weapons. Naturally, you do get some obligatory puzzle elements in most levels, which you must figure out in order to make progress. And of course, the levels themselves are a big difference to most other isometric adventures, not only in design, but more because most games are loaded in all at once, while the Last Ninja requires you to load all six areas in succession after the first one. Still, a prime example of a specific genre wouldn't be much worth to gamers today, if good gameplay was all it had to offer - which is something many are still not very convinced of. The atmosphere created by the exceptionally beautiful soundtrack and surprisingly scenic graphics makes a really great difference in having built the Last Ninja into the classic it has so often been titled as. 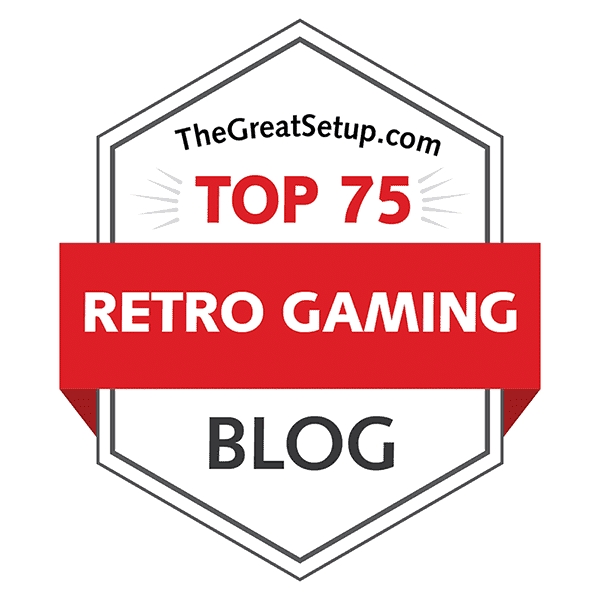 There is no doubt this is one of the all-time greatest games ever designed for the Commodore 64, and should be experienced by any retrogaming enthusiast, but what about the other versions? Seeing as these three machines are the only ones that have had the game released on tape, I might already make a bold claim at this point and say that the relatively long loading times on the C64 can be easily withstood. Of course, you could go with the disk versions, but where's the fun in that? Every other version is played from disk - in the case of APPLE ][, AMIGA and ST, there are as many as three disks. Actually, the original pre-release version of the ATARI ST version of the Last Ninja has four disks, but since the game was never released in its original form, it doesn't count. Of course nowadays, you can fairly easily play the game from a cartridge, an SD-card or another hard drive equivalent. Now, the important part is the loading screens and music, where available, both of which really should be dealt with in their proper respective sections. One of the most unique and impressive things about Commodore 64 was that some genius coders managed to get music to play during the loading screens, which doesn't seem like such a big deal now, but not that many 8-bit computers were able to do such a thing. When such an obscurity occured, it was something very extraordinary indeed, such as the loading music in the 8-bit Atari's Lone Ranger, which had the music played straight from the tape's other stereo channel, while the other channel contained the game data. In the Last Ninja, though, the whole meaning of tape loading music got expanded to set you into a new mood for the next level. 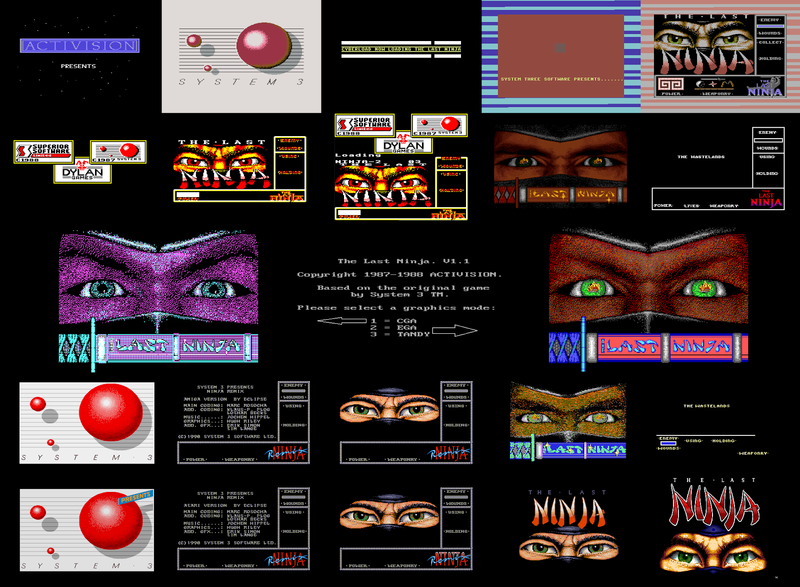 The loading screens in the first Last Ninja would be nothing but the Ninja's eyes shown in different colours for each level, accompanied by the level titles. Later on, Last Ninja II would give you some nice level-related artwork to go with the loading tunes, but the first Last Ninja game set a trend for game-specific loading soundtracks. But more on the tunes and graphics later on, when it's their turn. We do need to start this properly with what's the most important. The single most puzzling thing that aggravated many a newcomer to the Last Ninja games is the controls, so let's clear this up once and for all. Gamers more familiar with the control methods used by the Ultimate-styled isometric adventures will undoubtedly be sailing on unfamiliar waters here, because Armakuni doesn't control anywhere near a similarly restrictive manner. First of all, it's pivotal to understand, that each of your maneouvres is relative to both your facing direction, and the direction you are moving on the screen. Clearly put, moving diagonally up when facing towards either corner in the top half of the screen makes you walk forwards in the direction you're facing, and similarly diagonally down makes you walk backwards. Similarly, if you're facing either corner in the bottom half of the screen, down makes you walk forwards and up backwards. Granted, it's tricky to get used to. You make a turn by pushing the joystick (or other controller) into either the front or back along with the other diagonal axis you're not aligned in, and so you are only able to turn 180 degrees by turning the ninja 90 degrees twice. You can also walk in a movement diagonal relatively to the pathways (does that make your head explode yet?) - the manual says "cross width of pathway" - by moving in any direction apart from your straight aligned axis or the opposite axis. Phew... when you think this paragraph is only about the basic movement - sorry, but this is something that isn't easy to describe, yet it can become like a second nature to you, once you get the hang of it. The manual has a picture to go with the control instructions, but it involves numbers and gets even more confusing than merely trying it out by yourself. But that's the way it is in all the versions based on the original. All three represented ACORN computers do the controls in a notably different manner. What the ARCHIMEDES, BBC MICRO and ELECTRON versions hold in common regarding controls, are that there are only four directions, and nothing in between. You can play any of the versions with either a joystick or a keyboard, although in case of the ARCHIMEDES version, in place of a joystick, a mouse is the option, so you had better just get used to the keyboard controls. On the 8-bit Acorns, the directions are Z for left, X for right, * for up and ? for down. RETURN acts as the fire button. On ARCHIMEDES, the directional keys are A, Z, " and ?, and RETURN is the fire button. Uniquely, the Archimedes version also features an exclusive key for picking up items (P), and just one jump button (Right Alt). Next, the actions. Don't give up just yet, we'll get to the actual comparison soon enough. Pressing down the fire button and pulling the joystick into any of the diagonals will make Armakuni crouch, search and pick up objects, as well as block opponents' blows. Note, that in order to actually pick up something, your ninja's hand bit of the sprite will have to touch the object you're about to pick up - it doesn't matter how well aligned you are, as long as the ninja sprite's hand touches the object. Pressing down the fire button and moving forwards, relatively left or right will make him punch, and fire + backwards will make him kick. Once you've picked up a melée weapon, you get to do three different sorts of attacks with them by pressing the fire button and pulling the joystick forwards, left or right, and backwards will always make you kick. Each of the three attacks on each melée weapon have their own uses, and some attacks are more effective than others. Throwable weapons - shuriken and smoke bomb - can be thrown by pressing the fire button and pushing the joystick left or right. Naturally, the weapon you want to use must be selected before you can use it, by browsing through your weapons with Space bar. Fighting enemies doesn't require as much precision as you might think, but you do need to be aligned fairly well with your enemy in order to be able to hit him. As the fighting controls admittedly aren't particularly comfortable, it is a happy coincidence that you will only need to fight one enemy per screen, when there are any. One more thing: there are many places in the game that require you to do plenty of careful jumping, such as crossing a river or a swamp. Although you can (at least in the original version) jump backwards, it's never really needed - you are only ever required to jump somewhat forwards, so you need to familiarize yourself with how Armakuni jumps in any of the three possible directions. The manual calls them short, middle distance and long jumps, but basically, they're just jumps into the clean diagonal, or a bit off from the diagonal. Happily, most of the jump bits are similarly constructed, so you only need to focus on how to jump towards the up-right diagonal or its opposite. That, or familiarize the safe spots and directions you need to use in order to get over the tricky jumping bits. The ACORN versions deviate from this by actually having the three lengths of jumps, as the manual says: J, K and L for short, mid-distance and long jumps, respectively. Naturally, they've had to change the spacings of the logs and stones you're supposed to jump across, so that they'd correspond those jump lengths in a more suitable manner. As I said earlier, the Last Ninja is still very much an adventure game, more than it perhaps should be, and this means, there are some puzzle elements to it. For example, you need to pick up the pouch so you can pick up other non-weapon items and store them in it (apart from the ACORN versions, which don't have the pouch), and you need the key from level 1 to open a door much later in the game. I shall not spoil everything here, as it would take away from the pleasure of finding out and solving the puzzles by yourselves. Every object has its purpose in the game, though, and you need to use some of them in rather unexpectedly separate situations of first finding the objects. Different versions have the item browsing assigned for different keys: on C64, it's F5; on Amiga, BBC and ELECTRON the assigned key is H (as in "Holding"); the ARCHIMEDES version uses CTRL for it; the DOS version has it assigned for F1, the APPLE ][ version has it on backspace, and A2GS gives you the chance to browse through the items with cursor keys. Concerning the adventurous puzzle elements in the game, I should probably give another little hint for the newbies out there: using certain items requires you to disarm yourself before handling the items, such as climbing the cliff with the tiger claw. I have given too much information already to be able to start talking about the game as if nothing of importance had been disclosed yet, so I shall have to do a bit of self-repetition here. The Last Ninja is a fairly linear adventure game - although there are some areas you need to pass through at least twice within one playthrough, you rarely actually need to do any backtracking, unless you forgot to pick up something, or perhaps wasted your opportunity in the one of the rare timed missions in the game. All six levels of the game feature at least one screen, which you need to revisit at least once, but don't necessarily have anything of importance in them, other than perhaps a crossroads. Level 4, the Dungeons, feature an easy maze-like structure, which you need to master, but other than that, there is very little of anything that would make anyone confused. Only the ARCHIMEDES version has been redesigned almost completely, giving it a huge number of completely new screens, item locations and level structures, but otherwise, the basic gameplay is much like in the other two ACORN versions, only perhaps more focus has been put on defending yourself by crouching, as well as fighting all the bad ninjas. Apart from the ARCHIMEDES version, the game has no score counter, and it wouldn't really have much purpose in the end, as the object is merely to complete the game. Besides, there is something peculiar about the way the game works, which is unlike most other multi-load titles: if you complete one section, but then your game is over in the next one, you shall only have to start from the beginning of the current section, with all the weapons and items you had in your possession at the beginning of the current section. In other words, only the level data and your progress in it gets reset. This sort of a system doesn't really make having a high score table very sensible. You get three lives at the start of the game, and a fair amount of energy, which gets depleted when taking hits from enemy ninja. There are some things that kill you instantly, such as falling into a water hazard, or getting attacked by a monstrous spider or a guard dog. You can gain extra lives by picking up apples at certain designated spots within each level. Usually, there is one apple per level, but the final level doesn't have any, so you'd better be properly prepared for it. Uniquely, again, the ARCHIMEDES version features new items that look like the Yin Yang-symbol, which refill your energy meter, as well as new quest-related items. Although at first, it might look as though the game has only one type of an enemy, with some different clothing and weaponry, if any, there is also variety in their movement speed, attack rate and even AI, if you want to call it that. Some of the enemies like to align themselves so that you will have as hard time as possible at hitting them, so you really need to develop some different sorts of strategies for dealing with the different enemies. But still, all the defeatable enemies are very much human-like. Only the skeletons in the Dungeons look decidedly different from all the other enemies, but they can also be dealt with less of a bother, although they do cause more damage than a regular enemy. Now, for the actual juice of the fruit. The 8-bit ACORN versions are the ones with the most gameplay differences, so I shall start with them. Apart from the simplified directional controls and three separate jumping keys, the three attacks given for each melée weapon don't appear to have nearly the same impact, nor are the moves all that different from each other, as they are in all the non-Acorn versions. Contrary to all the regular versions, you cannot pick up items when holding a weapon. From a quick attempt at a play-through, I could also notice some enemies are completely missing, which must have been made so to balance out some of the other enemy attacks, which sometimes are so fierce, you cannot escape them once they have begun. Since you cannot move backwards, you don't have to climb the wall backwards in level 2. The Dungeons are designed rather differently, and here you can actually kill the giant spider with an object unique to the ACORN versions. Actually, this is something that was rumoured to have been planned for the C64 version, but didn't make it into the final builds. But while these all are interesting differences, the worst of them all is the collision mapping, which is sometimes way off, and the game is better at aggravating you due to bad collision maps than keeping you entertained. That's probably not quite everything I could say on the matter, because I cannot get into the fighting logic on the Acorns, but I'm sure you get the point from what I've already told you. If you want to play the DOS version with any success, I do not recommend using a DOSBox, because the controls are awkward at best. Using a USB-joystick will not work, even when calibrated properly, as your ninja will be leaning to the top right direction by default. The DOS version was clearly not designed with modern retro controllers in mind. Even though using a keyboard is the preferred choice, it's still awful, because any direction you lead the ninja into, will stay on until you push the centering key - you see, the ninja is controlled from the numpad. So you might already realize, changing directions is awkward, because you always need to push two numpad keys before the ninja changes his direction from one diagonal to either of the adjacent ones. Then of course, fighting enemies with this problem is practically impossible, because the key presses don't get registered immediately, and you will always end up walking backwards or jumping or whatever, before an attack maneouvre actually happens. The problem is solved by actually playing the game on a proper DOS-based PC, but you still need to have an old EGA machine (something with a 286 processor, perhaps) to make it run in the correct speed, and then use a joystick. Otherwise, you'll end up dying on the second or third enemy you will come across. I only got to the end of level 1 at best. In addition to the speed problems, there are some problems with collision mapping (only in some screens) and great possibilities of getting stuck due to this very problem. For example, I have managed to get myself stuck in the first section, inside the rock with the sword on top of it. But otherwise, in principal, the DOS version plays quite close to the two APPLE versions. Unfortunately, the only disk images I've been able to find of the APPLE ][ version are corrupt, and impossible to proceed through the second level. The game's graphics get increasingly corrupt as you make progress, and the game will eventually halt when you attempt to load the next screen. But if that weren't a problem, I'd say it played very well indeed. The only actual gripe I have with it, is that the Apple ][ version loads every screen separately, making it a bit slower than most versions in that sense. Happily, the A2GS version works completely. The only real gameplay differences that I found in it to the original were, one: that if you finished the previous level with less than a full energy meter, it would stay that way when you started the next level, although having a Game Over in that section would fix that problem, and give you a better chance at more lives when restarting the level thus. In the original, the energy meter is always refilled at the beginning of each level. And two: in later levels, when there are more graphic elements on screen, the less animation frames would be shown, although the game speed would remain the same. When this happens, hitting anything becomes very difficult, and the game turns into a chore rather than a game. I cannot tell, whether the same problem happens on a real A2GS, since I've never actually even seen one, but if the way the game plays through emulation gives any direction, I'd still choose the original over this. As has been mentioned already, the officially unreleased original pre-release for ATARI ST features the whole game, at least all the levels and objects of it. 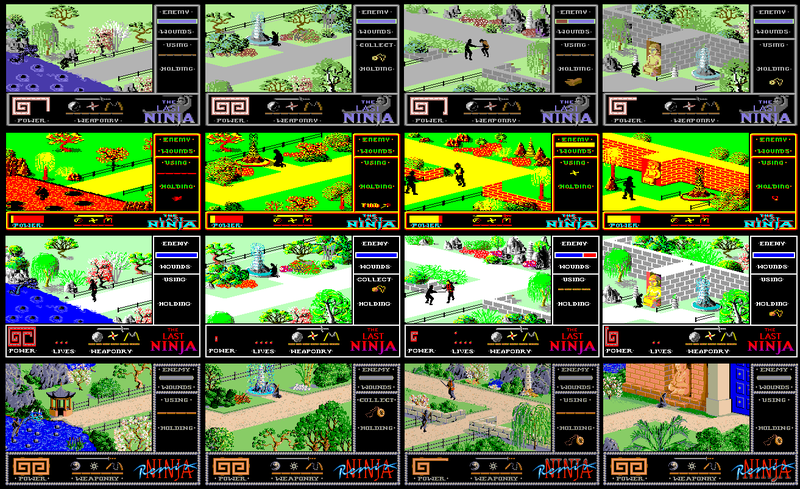 There are some differences between the final version released as Ninja Remix and the pre-release of The Last Ninja, such as less balanced fighting and enemies that respawn already on the first level, but it also has the diagonal controls completely unimplemented, so you can't pick up any objects. So, I can only really concentrate on the official Remix releases. Both the AMIGA and ST versions play, from what I could tell, exactly the same, and why not, since there's not much you can do differently, when the same team is responsible for both versions. The most obvious difference to the original C64 version is the ability to save and restore your game between levels. The weird thing is, if you need to restart a level, it also needs to be reloaded into the memory, but at least that doesn't mean all is lost from your inventory - in that regard, everything is as it should be. Only a bit less immediate. The most irritating less obvious difference is, that all the jumping bits are more particular about where you land, and the ninja jumps in slightly different lengths, so it doesn't feel the same. Of course, this only means you just need to learn another way of dealing with it, but since it's really the most annoying part of the game, you would rather not. The difficulty in jumping across things has been balanced in the fighting, as it has been made superbly easy for the most part, and if you know what you're doing, it's next to impossible to get hit by the enemies, because you can easily deliver endless consecutive hits, if you feel like it. I'd say the AMIGA and ST Remix versions are the best way to introduce anyone to the Last Ninja games, but I'm more partial towards the more difficult original, because it's more of a challenge. The last one on the list is the ARCHIMEDES version, the differences of which have already been touched upon briefly. In addition to the almost completely redesigned controls and the total redesign of all the levels, the enemy behaviour is quite similar to that of the 8-bit Acorns' latter levels - practically impossible to deal with from level 2 onward. Unfortunately, the Archimedes version doesn't have the grace to give us the chance to learn each level in our own time, as the game only gives you the chance to continue from the previous level, with the amount of lives and energy you previously had when you got to that point. The best way to win the game is to learn the best strategy to fight the enemies and hone those skills to exhaustion. Unfortunately, I don't have the luxury of time to put into that amount of practice, so I'm going to take the easy way out and use a video from YouTube to get the necessary screenshots. In the end, the Last Ninja's results for Playability are quite easy to put into an order. The original version is not perhaps the most smoothed-up version around, but it does play very smoothly, even compared to the Amiga and ST versions. However, it performs better in the balance in difficulty, and if you want to take loading bits into account, the C64 version doesn't need to reload a level when restarting one, and you don't need to change disks nearly as often. The A2GS version starts showing difficulties in keeping up with the graphics in the later levels, but I'm not sure whether that's a problem with KEGS or does this happen natively on an A2GS. Confirmations for this would be appreciated. The APPLE ][ version shows great promise, but I couldn't find a working copy of it - its spot on the list is based on the assumption that the original disks have no such problems. The DOS version is the most disappointing of the lot, because it looks like it could play quite well, but too many conditions need to be met before the game is actually playable. Even the ACORN versions feel better, but only slightly, and curiously, the 8-bits win the weird remake. If there's one thing the C64 is not at its strongest in the Last Ninja, it's the graphics. Not that they're ugly or anything, it's just that the old hardware does set some limits compared to the newer hardware. But for the amount of graphics in the game, it's a bit surprising, that about 99% of all the graphics, including loading screens, are contained within the same set of frames. Frankly, I'm afraid this will be a bit too easy to work out... Anyway, you know the drill: click on pictures if things seem too small. Loading screens and title screens. Top row: Commodore 64 disk and tape versions. 2nd row, left to right: Acorn BBC Micro, Acorn Electron (middle), Apple //GS. Middle row: DOS CGA/EGA. 4th row. Commodore Amiga (Ninja Remix, left to middle) and Apple ][ (right). Bottom row: Atari ST + Acorn Archimedes. Basically, the loading screens act as the game's title screens, since there are no other kinds of title screens, once the game has loaded. On the C64, we get three variants on the loading sequences: the original System 3 tape version (Cyberload, three different screens), the System 3 disk version with the System 3 logo shown before the regular Last Ninja loading screen, and the Activision disk version with the "Activision presents" screen added to the System 3 disk loader. 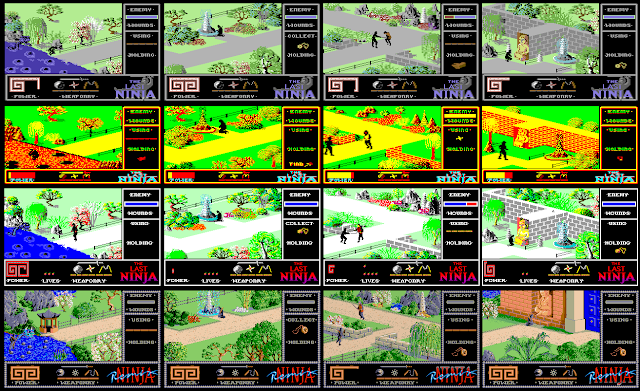 The 16-bit Ninja Remix versions follow the System 3 disk version's form, and the 8-bit ACORN versions do their own version of the tape loader, now featuring Superior Software's and Dylan Games' logos alongside System 3's. The last one featuring a rendition of the regular Ninja eyes is the ARCHIMEDES version, which has no other loading screen as such. 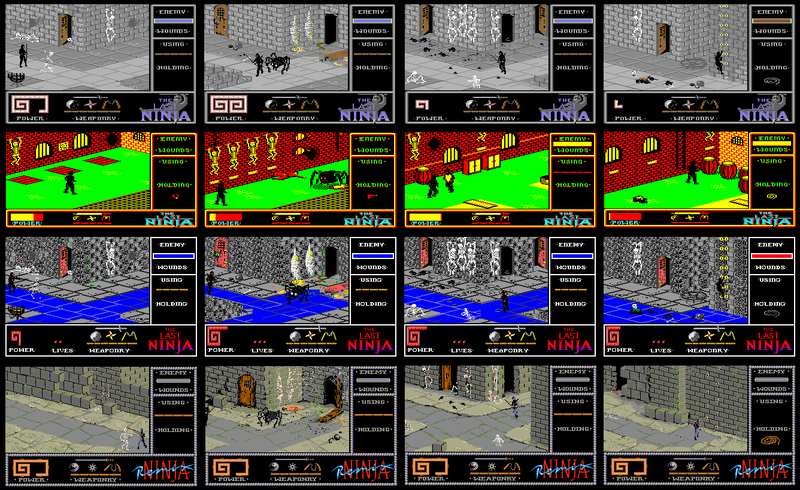 The remaining three - DOS, APPLE ][ and A2GS have different looking title screens, featuring animated katana sheath, with the title written on it, and different credits switched onto the katana blade; also, the Ninja eyes look very different here. Strange, really, but this is the only thing about the Tanager Software conversions that looks decidedly different from the original. Now, on to the in-game screens. I'm going to group these into two, but since it's not quite as simple as going with 8-bit and 16-bits, I've had to go with the less powerful machines and the more powerful ones. The less powerful ones include C64, ACORN BBC MICRO (and ELECTRON), DOS CGA, DOS EGA and APPLE ][. The ACORN ELECTRON version looks otherwise exactly the same as the BBC MICRO version, but in the bottom section of the info frames, the title logo and the power indicator text are green instead of light blue, so I didn't feel like including it in the graphics comparison. The more powerful ones are APPLE ][GS, ATARI ST and AMIGA, of which the latter two look exactly the same. The ACORN ARCHIMEDES version will be dealt with separately, since it's such a different-looking beast, and doesn't fit to be compared with any other version. Commodore 64, Acorn BBC Micro, DOS CGA, DOS EGA, Apple ][. I might have accidentally chosen all of these screens such that contain no fighting, but no matter - some of that will be coming up surely as anything. The reason why there is no CGA screenshot of the dragon is, because I got tired of trying. The DOS version really is so tiresomely impossible to play due to the speed problems. First things first: the bordering info bits. Judging by the early mock-ups of the game presented in some magazines, the game was supposed to have more depth with a hunger meter and some other extra things, but in the end, we got energy meters for the Ninja and his enemy in the occupied screen, the weaponry, the currently used weapon and the currently held quest item, and of course the game logo in the bottom right corner. In the "Using" slot, you can also see the item you've picked up, and for the occasion, the "Using" text changes to "Found". Also, when you go to pray at any designated spots (in front of a Buddha statue or a fountain), you will see the closest-by item to your current location, which you will need to pick up, accompanied with the text "Collect". The DOS version follows this design otherwise, but you are additionally shown the number of lives between the Power and Weaponry slots. 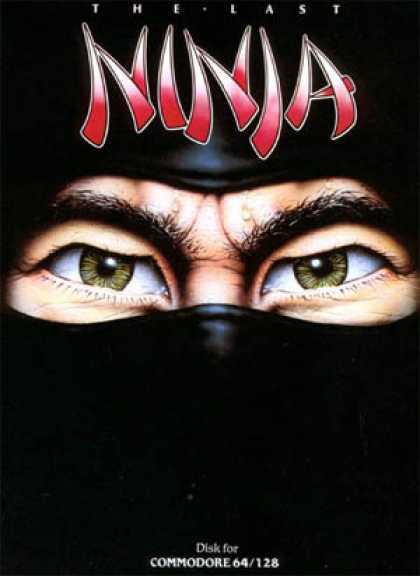 However, the game logo doesn't have the ninja in the background, but it is more traditionally red as it is in the cover art. In the 8-bit ACORN versions, the Power meter looks vastly different and more simplistic compared to the rather earmuff-like original design; there is no "Weaponry" text in its designated place, although the weapons will appear there; and the game logo has no ninja in the background. Curiously, when praying, the suggested item to find appears just above the game logo, instead of in the same slot where the used weapon is shown. For the APPLE ][ version, the bordering info things have been very much redesigned and rearranged. The game logo is not present any more, your power meter is shown as a long blue pole, above which the number of your lives are shown; and the bottom row consists of the enemy's energy, the weapon and item in use, as well as your weaponry in the corner, where the game logo usually is. What interests me the most at this point is the number of colours used by each version in the above picture. The CGA DOS and ELECTRON versions share the number of colours used, which is four. The BBC MICRO version adds one to the mix. The APPLE ][ version has plenty of colour, but from the 13 colours I noticed being used altogether, I couldn't see more than 10 colours used at a time in any screen. In the DOS version, you also get an EGA mode and a TANDY mode, but I couldn't notice any differences in them - they both are able to show 13 colours at once. The C64 version seems to top this one up with 14 colours. In addition to the colours, we also have to consider the animation quality, the screen modes and the sprite drawing techniques, but we'll get to that later on. 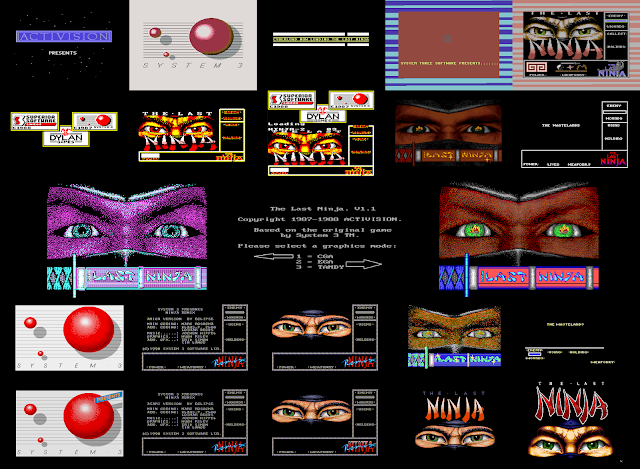 More screenshots from level 1: Apple //GS (top row) and Commodore Amiga/Atari ST (bottom row). Funnily enough, the A2GS version still looks very much like a copy of the original, albeit with slightly more colours, allowing for a slightly better use of shading. Then again, I'm not very convinced that all the chosen colours are quite as thoroughly considered as those in the original - I don't think I've ever seen a white pavement before, and some of trees look more natively Japanese on the C64 than they do in the APPLE and DOS versions. Also, there's that lives indicator at the bottom row, as was featured in the DOS version. The A2GS's graphics are very close to the original, only slightly smoother in terms of pixelation. Having loved the original version's graphics style since the first time I saw the game, I was a bit shocked to see for the first time, how much better the AMIGA/ST Ninja Remix's graphics look like. Finally, everything looks more their part, and nothing has been overdone to distract you. Every bit of detail has been drawn in to make the game environment look more natural, and less of a computer-generated maze. The pathways are now made of gravel, there are more rocks and trees around, the grass looks more grassy and unevenly grown than the precision-cut look in all the other versions. Needless to say, there's quite a lot more colour here than in any other version. Also, the info bordering features exactly the same things in the same order as the original C64 version does, only the game logo has been changed to the Ninja Remix logo. First screen of level 2 (the Wilderness). Top row, left to right: Commodore 64, Commodore Amiga/Atari ST, DOS EGA. Bottom row, left to right: Apple ][ (from corrupt disk images), Apple //GS, Acorn BBC Micro. Unluckily, it so happens, that all the versions available don't really work well enough for me to get some much-needed screenshots, and there are not enough screenshots available on the internet to get enough material to get screenshots of all levels for all versions. The only APPLE ][ version I've found has corrupt data in level 2, making it impossible to complete. Also, while the DOS version works as well as can be expected, it's still impossible to beat. In any case, you can imagine what the DOS and APPLE ][ versions look like, based on the A2GS version and all the other necessary info already divulged. So, from this point on, I will only focus on the C64, A2GS, BBC MICRO and AMIGA/ST Remix versions. But in the above picture, we have a nice reminder of all six notably different-looking versions, not including the ARCHIMEDES version, which is too damn different. Commodore 64, Acorn BBC Micro, Apple //GS, Commodore Amiga/Atari ST. I guess you could say, all versions have their own strengths. The ACORN versions have less details, so you're not very likely to get distracted by the graphics... if that can be considered a good thing. Of the 8-bits, the C64 version has the most natural colours, while both the APPLE versions feel a bit sunburnt. The A2GS version has a higher screen resolution, so most of the graphics look just a little bit better. Some things, like the dragon's breath of fire and minuscule details in all the plants and structures, look quite a lot better than on the C64. The same could be said of the DOS EGA version, but the CGA mode looks uncomfortable. Of course, the AMIGA/ST Remix looks easily the best in every possible way. Death animations. Top row, left to right: Commodore 64, Acorn BBC Micro, Commodore Amiga/Atari ST.
Bottom row, left to right: Apple ][, DOS EGA, Apple //GS. Let's take a look at the death animations, just for a change. In the C64 version, after you've dropped down to the ground, the action screen randomly fills up with green dots, only showing you and the possible enemy sprite within the green as you were; then fades to black, before the screen you died in appears again with no particular ceremony. On the two 8-bit ACORN computers, the screen drops down and then a new one drops down from above. The APPLE ][ version merely erases both you and your killer from the screen after you've been knocked down, and you both reappear just as abruptly as you vanished - nothing happens to the screen you occupied at the moment. The A2GS and DOS versions follow the original in that the screen dissolves in a similar manner, albeit using a different colour and size of the dots for the effect. Since the 16-bit Ninja Remix was released after Last Ninja II, it's no surprise that something was left from that engine: as the screen dissolves, you will notice a similar "Lives remaining" message being revealed while at it, as Last Ninja II uses. And so, the AMIGA and ST versions are the only ones featuring this bit of text. Level 3 (Palace Gardens) features some of the most scenic graphics of the whole game, with plenty of attention put into getting the level look like a formal garden, rather than the wilderness shown in previous two levels. There are plenty of water-related ornaments, new structures and new trees and other flora included in the surrounding sceneries, even going so far as to show fish jumping in the rivers and some sort of a water dragon making an appearance in the most watery area. It gradually becomes quite clear, that the 8-bit ACORN versions feature quite a bit less detail than any other version, and the 16-bit Ninja Remix features quite a lot more of detail than any other version. Not only that, but some of the more important graphic elements have been made more realistically proportioned on the Remix versions. This is where the two versions most differing from the original really start to deviate. The ACORN version doesn't really have much of a maze, the level layout is completely different, the giant spider looks like it was drawn by a five-year old, there are no skeletons (apart from the ones hanging on the walls) or ghosts here, and every room looks very unlike any dungeon I've ever seen in any games, mostly due to the bad colour scheme. In all the other versions, the skeletons are threateningly alive, there are two different ghosts wandering around, there's some gory details in the area, and the giant spider looks ugly and threatening. The Remixed version looks even more realistic with its broken and uneven structures, spiderwebs and all those other little details. Since there isn't much to talk about regarding the general in-game graphics, I'll combine the last two levels into this one thing here. You start level 5 from outside the Palace, then get inside and finally roam around the Inner Sanctum, where you can find a few surprises alongside Kunitoki himself. Again, there are some very notable differences in the ACORN and AMIGA/ST versions, such as the decorations outside the Palace, and some slight differences in structure. In the 8-bit ACORN version, though, the dog is not a dog, Kunitoki doesn't look like anything more than a regular evil ninja, and the telescope room doesn't have a telescope. Again, the AMIGA/ST version is easily the prettiest, but I was surprised to disagree so much with the colours in the A2GS version - the inside of the Palace is just about as garish and extreme on your eyes as the 8-bit ACORN version is. But this is as far as I will take you; I shall leave the ending to your own achieving, even if it's not that much to look at. Armakuni's animation frames: walking and swordfighting moves. Left: Commodore 64, Apple //GS, DOS, Amiga/ST. Middle: Acorn BBC Micro/Electron. Right: Apple ][. Even though most of the background graphics are very nice to look at in most versions, the Last Ninja's animations are some of the best that any 8-bit game has ever had to offer. There are three basic groups of animation quality: the ones firmly based on the C64 version, the 8-bit ACORN versions and the ARCHIMEDES version. Also, the APPLE ][ version has a bit more personality in its animations, but whether or not its quality is actually good, can be argued. Although all versions have the Armakuni's walking animation done for eight frames, the fighting movements are a bit different, as you see in the above picture of compiled frames for each of the main moves. Maneouvre #1 in most versions is a forward-stab, #2 is a diagonal slash, and #3 is supposed to stab or slash the opponent's neck. As you can see, the ACORN versions don't seem to really do any of those - there, #1 is a sideways slash, #2 is slash downwards and #3 is slash upwards. The ARCHIMEDES version follows the 8-bit ACORN's animations quite closely, only it looks like a 16-bit version of it all. Unfortunately, I couldn't do a similar frame-by-frame comparison, because Arculator doesn't have a speed limiter or a screengrabber like most emulators, so you will have to either take my word on it, or seek out a video on YouTube. Something you cannot really see here, nor would it make much of sense to grab screens for this comparison, is that there are some Ninja Magic effects in the game, which make your ninja flash in different colours or whatever, depending on the version. 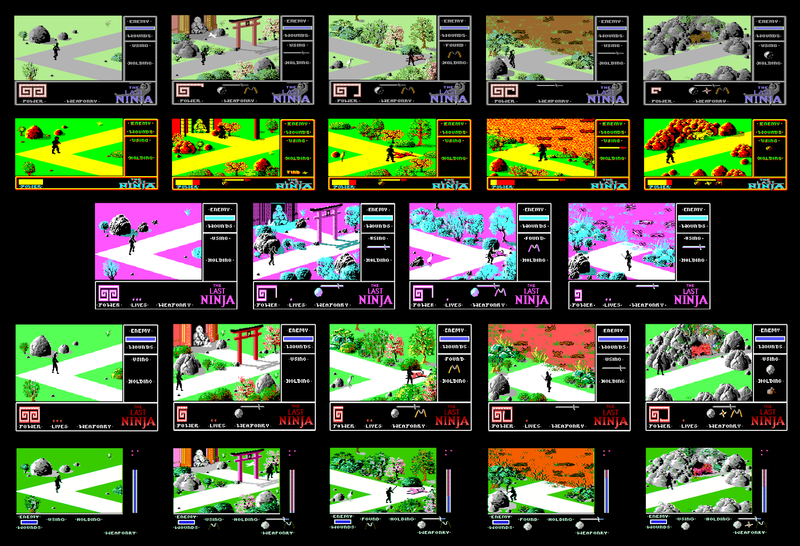 The C64 ninja uses several different kinds of magic effects, the first of which is a colour scroller, and the others will make you appear in a single, different colour. The A2GS version and the 16-bit Remix versions only makes you flash invisible/visible. The 8-bit ACORN versions make you flash through the three primary colours: yellow, green and red. The other versions I have no idea about, actually, because the APPLE ][ version doesn't work far enough and I have only managed to play the DOS version far enough by using a cheat mode, which makes it impossible to pick up any objects. However, my educated guess would be, that in both of these versions, the ninja would do the invisible flash thing. Correct me if I'm wrong. Screenshots from the Acorn Archimedes version. To make up for the ARCHIMEDES having gone missing so far from this section, here we have a few screens shown from all over the game, compiled into one big happy collage. As you see, it is quite a lot different from the other versions. Although the 16-bit hardware certainly helps to give it plenty of colour and higher-res graphics, it also looks a bit plastic on the whole. On the plus side, there are much more locations and items to wonder at, but for a big minus, the garden-like bits all look quite samey, and there is no sense of dread or peace anywhere in the game's new graphics. It's all a bit too much, really. But that's just my opinion. Truthfully, the graphics look technically rather splendid, but I'm just not very fond of the redesign. In all versions of the Last Ninja, you can get an ending screen, but since I'm not going to spoil it for you, of course the alternative is a Game Over screen. Curiously, though, not all versions have one. Then again, it's only the lot which Tanager Software was responsible for (APPLE ][, A2GS and DOS), so at least they were being constant. From those versions, which actually have some sort of a Game Over screen, the 8-bit ACORN version uses that space as an additional title screen of sorts. In the other three versions (C64, AMIGA/ST and ARCHIMEDES), it's all fairly self-explanatory, as you can see from the screenshots. Only the C64 version has some colour effect going on in the "Press Fire" line. And so, we get back to where we really started from, since it was already suggested in the Loading section, that the game's music was a pivotal part of the whole experience. The Last Ninja's soundtrack originally written in collaboration by Ben Daglish and Anthony Lees consists of six in-game tunes and five separate loading tunes; the Inner Sanctum in-game tune is the same as the Dungeons loader tune. Strangely enough, Ben Daglish has commented on working on the soundtrack with Anthony Lees by saying, that they barely ever met - just once during the production of TLN's soundtrack, and even then it was just a brief exchange of greetings. All eleven tunes make for a very solid soundtrack, but if I were to choose my favourites among them, I would have to rip the soundtrack apart and see what's in there, so bear with me - this will be a long trip. It all starts off with Ben's peaceful introduction, played during the initial loading sequence. It's very heavy on the use of oriental pentatonics, and even heavier on making the SID produce sounds that would be as reminiscent as possible of different eastern instruments. This really feels like it's conveying the Ninja brotherhood's journey to the island of Lin Fen. I don't think any other tune brings me as much peace as this one, but simultaneously, because it's the main loader tune for the Last Ninja, it's mixed with high anticipation. Then suddenly, the adventure begins with a more actiony tune with another Daglish tune, and now with proper percussions added to the mix - another iconic tune, and quite possibly the most recognizable tune from the soundtrack due to it being the first you'll hear, in case you don't have the original tape version. Curiously, if you have the original System 3 disk version, the first tune you'll be hearing during the first loading screens is the one used as the level 2 (the Wilderness) tape loader tune, by Anthony Lees - a relatively characterless tune, which suits the level 2 loading section better than the introduction. In level 2, we get to hear Lees at his most progressive in chiptune pop, constantly building and moving the song into a new direction; another one of my favourites in the whole soundtrack, actually. Then, we move on to load the Palace Gardens. Here's another tune by Lees, now in a more jungly setting, rather like something you would expect to hear in a Rambo or Platoon sort of a game. The in-game tune for Palace Gardens is Ben's handiwork, and another one of my favourite tunes in the soundtrack, because it exploits the eastern harmonics and rhythmics so masterfully in a rather stiff waltz-based rhythmic pattern. Fits the setting perfectly. Then, we have the transition to the front of the Palace, which should be a fairly positive change (as seen by the music, giving us an unexpected rocking tune here), but we all know the pathway has a trap leading us into the Dungeons underground. Anthony Lees' masterful handling of the SID chip is proven here at the very latest, as the screechy horror sounds fill up your senses, before the alerting music is brought to the front. It's absolutely spine-chilling, and is exactly the opposite to Ben's peaceful intro tune, and I love it. Next up, the only tune to be represented in the Last Ninja preview, which was chosen as the loader tune for the Palace section. Another one of Anthony's, this one feels like a hasty, panicky semi-disco sort of a thing, but fits the bill rather nicely in that "now it's time to get serious" sort of a manner. Unfortunately, the in-game tune for the Palace isn't quite as interesting, and feels more like a filler, similarly to Lees' earlier level 2 loader tune. Then again, entering the Palace isn't quite as interesting as the final bit of the game. The final loader tune, again by Lees, certainly adds its own part into the anticipation, but still feels a bit rushed. And then we end with a revisit to an earlier tune, which works surprisingly well in the context. The only thing missing from the soundtrack is a proper ending tune, but that's only because there is no proper ending. Also, if you're more into sound effects, you're in for a bit of a disappointment in the case of the C64 original, since there aren't any. But with such a great soundtrack, you might want to attend a few classes in music appreciation. Still, if you want to play the game without music, just press F1 and you will be rewarded with silence. If you do like to listen to sound effects more than music, then you're welcome to choose almost any of the other versions. The APPLE ][ version has only a few sampled sound effects, at least only a few that I noticed, but they sounded very good. The A2GS version has very similar sound effects, but more powerful and of course, they have a better sample rate. However, the A2GS version also has a title tune, which is little more than a cheap sampled beat, and one loading tune, which doesn't sound like anything that would have been taken from the original, but it plays between every level. If there's anything that the loading tune reminds me of, is something Egyptian. Gets kind of annoying after a while, but it's still better than no music at all. The DOS version plays its sounds from the PC speaker, so it's beeps and bloops all the way. Again, there's one short tune that plays at the beginning of each level, but there are slightly more sound effects than in either Apple version, so I guess that could be considered something like a recommendation. But remember the playability. Neither of the 8-bit ACORN versions feature music, and the ELECTRON version has more random-sounding bleeps and bloops, compared to the BBC MICRO's more composed set of sound effects. Actually, the BBC sound effects have the most variety of all versions so far. The third Acorn machine of course features a lot more sophisticated sound effects, and plenty of them, too, but it also features an in-game tune. Yes, just one tune, and it's a relatively short one that loops infinitely, and only has a brief stereotypical indication of it having something to do with eastern themes. Still, not nearly the worst of the lot. Finally, we have the 16-bit Remix versions, but I might as well mention in this context, that the ATARI ST pre-release version features music taken from System 3's International Karate, although it's actually more of a mixture of IK and IK+. I guess, at that point, Jochen Kippel hadn't been around yet to convert the Daglish/Lees soundtrack. Even as such, the Remix version has a strange mixture of the original soundtrack - the initial loader tune is used in the Dungeons (not fitting at all) and the only Lees tune remixed is the one for the Palace level, and instead, the tune used for the title screen is the one from the Inner Sanctum, which has been used twice. So there are only six tunes included. But at least, the tunes have been slightly updated, so that they are looped more naturally, and the AMIGA version in particular has a properly remixed soundtrack. The ST soundtrack just sounds more like the C64 original, but without some of the more advanced filtering tricks and all that. Similarly to C64, though, neither version features sound effects. 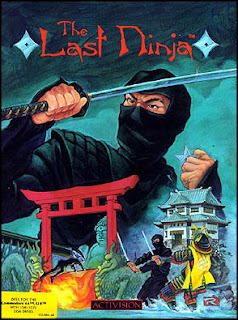 The Last Ninja was also advertised and supposed to be released for the Atari 800/130XE, TRS-80 COCO, SPECTRUM 48/128 and AMSTRAD CPC computers, but these were dropped for whatever reason. At least LN2 got released for the latter two, but the 8-bit Atari computers and TRS-80 were left completely without their Last Ninjas. The Last Ninja Archives have scans of a rare Olivetti box of the original Last Ninja game, published by Superior Software, but I haven't managed to track it down yet, and I wouldn't know if I was even able to actually play it. Perhaps that will have to wait for an update, long into the future. Of course you must be aware of the other two Last Ninja games, plus the 8-bit Remix version of Last Ninja II, but there have also been a couple of attempts at creating yet another sequel. The original fourth game was planned in 1993 by John Wells, and following a series of previews, System 3 cancelled the project. Many years later, a third-person 3D reincarnation of the Last Ninja was started, and was to look and play similarly to Tecmo's Ninja Gaiden at the time. This Last Ninja 4 was planned to be released on the XBox and PlayStation 2 consoles, but due to a broken deal between System 3 and Simon & Schuster, the development was canned. Next year, the Last Ninja will be 30 years old, and while we will always have the original trilogy (and the remix) to enjoy, it would be more than appropriate to celebrate the series with something very special, but I'm not very optimistic - at least where the current System 3 is concerned. We do have something very nice and proper to make use of, if nothing else occurs: Last Ninja game editors. 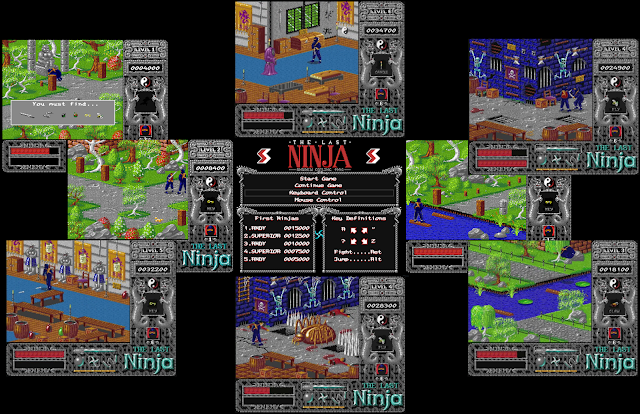 Two of the most frequently updated ones are SoA's The Last Ninja Engine, which is based on LN1, and Marq Watkin's JANE - Just Another Ninja Engine, which is now based mostly on the LN2 engine, but has lots of new features never before seen in the original trilogy, such as multiplayer modes, new weapons and new moves. As much as I would love to, I haven't got the time to work on something with these editors, so I implore you readers: make use of them and produce something great for next year's celebrations, because System 3 likely will not. Finally, I'd like to take a moment to dedicate this entry to not only Kai Spitzley of the Last Ninja Archives, whose website has provided me with plenty of useful information regarding this article, but more importantly, a man who played a pivotal role in the making of this entry: a longplayer by the handle of Laffer35. Without his longplay video of the Archimedes version, and subsequent findings regarding the said video, I would probably not have been able to find a way to get all the versions covered here. Sadly, while doing the research on the Archimedes version, I also found out that he passed away a little over a year ago. Kai Spitzley told me of Laffer35's helpfulness regarding certain additions to the Last Ninja Archives as well, and I was well aware of his existence from plenty of earlier retrogame longplay videos. A great loss, to be sure, so here's to you, Laffer. That's all for today, hope that made up for the relative lack of entries this month! Thanks for reading; see you next month with more wonderful retro things in familiar and less familiar forms! There is a music Kickstarter ending today, perhaps if you are quick you can still pledge and get all the Ninja themes? You did an absolutely STUNNING job with this review/compare. Kudos and a deep bow to you for sharing this with us. You have done marvelously extensive work here. Did you by any chance come across who did the Activision cover art? What an outstanding resource - exactly what I was looking for! You, sir, are a last ninja MASTER!